The first one cleaned up to ‘good enough’ by doing “all of the above” so I’m going to do the same with the second light. Odds are it’ll be the same sort of problems and clear up with enough fiddling. Just posting for the record, basically, at this point, so I don’t forget what I noticed when. I just received 8 lights with at least one of each color, and none had the foam donut. All worked well with no major issues. The green one did act funny at first, very touchy when changing modes and quickly going past a mode like a “double tap”. This was resolved after a tear down. 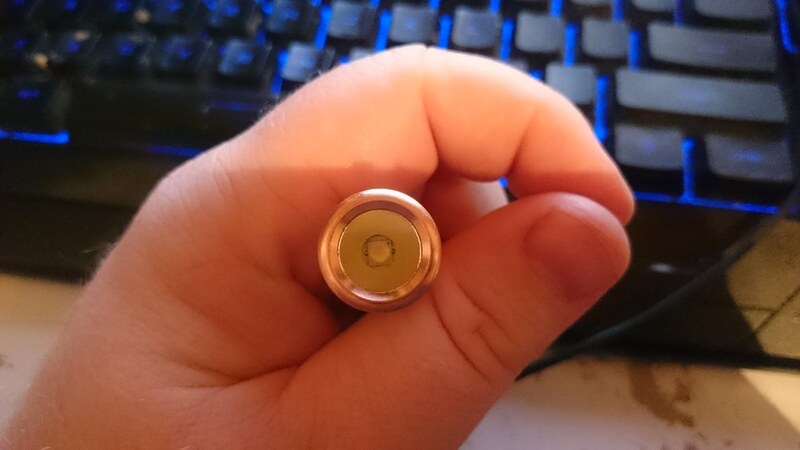 The pill was slightly loose compared to others, and the tube had a burr or flake of ano that I scraped off. Love the little lights and will have a problem deciding which I will be OK gifting. I’m interested in a GB for this one too! oh, no foam ring on my 2nd orange light either. Flicker problem solved by “all of the above” treatment. Little metal fragments were the main problem on this one, ragged edge where the threads on the body were cut flat at end of tube. I’m assuming that one flash when going into the low level (fairly soon after it’s been bright) is normal. That seems to go away if it’s set for a while off, before the next time it’s turned on. They really should chamfer the sharp edges around the lanyard hole too. On this light they’re not just sharp, they’re ragged and the orange paint flakes right off at the sharp edges when I run a fingernail over them. I’ll smooth them down (like the first orange light) so they aren’t sharp enough to cut right through a piece of string. Good enough, about what I’d expect. My black A01 came in yesterday. Took about 10 days, not too bad. Cute little light with impressive fit and finish. Beautiful tint; I’m in love with Nichia. Now I’m waiting patiently for its cousin, the Cu A01, to materialize. Code is not working now because it's on "promo" for $9.95 from China Warehouse. Also the code doesn't work for the US warehouse where the price is higher, at $12.95. Location: on the edge of earth! Honestly, I am disappointed – at this pricepoint, they certainly have a good room to improve. They work fine now, but given the QC horror, I am not sure how reliable they would be. I’m waiting to hear back from Banggoods on the DOA light as well. Let’s see. None of mine has the foam donut. I believe that is a spec change, not a QC issue. Two of mine have off-center emitters, but they don’t affect output. I had issues with one of my copper A01’s. The tube machining was off. The thread section was shorter than it should be, making an unreliable connection that eventually quit. But BangGood replaced my light after I showed them photos of the issue. Bummer to hear about so many quality issues with the cheaper models, though. That’s pretty sad. DOA may happen as they don’t QC every single light. But noticeably offset emitters shouldn’t be happening. When a person puts the light together, it will be obvious just by looking at it. It still isn’t an excuse for shoddy QC, especially if they plan to charge the listed price. How much QC you need on something that is just over $8? The high CRI LED alone in this light is $4 retail at Mtn Electronics, Illum, etc. The light has three modes and a strobe after two mode cycles. It is available in half a dozen colors… Please find and submit a link to a light with all of these features and output levels and runs on an AAA battery, then you can talk about shoddy QC if the one you find is better. The no foam doughnut IS a spec change, they had more issues with it holding the battery off the board than rattling, so it was apparently eliminated… If you bother to read threads or do a search, you will find several members had this issue, it was addressed. Yes, that’s the way they all seem to be produced now. I’m not sure if it’s an issue or not. 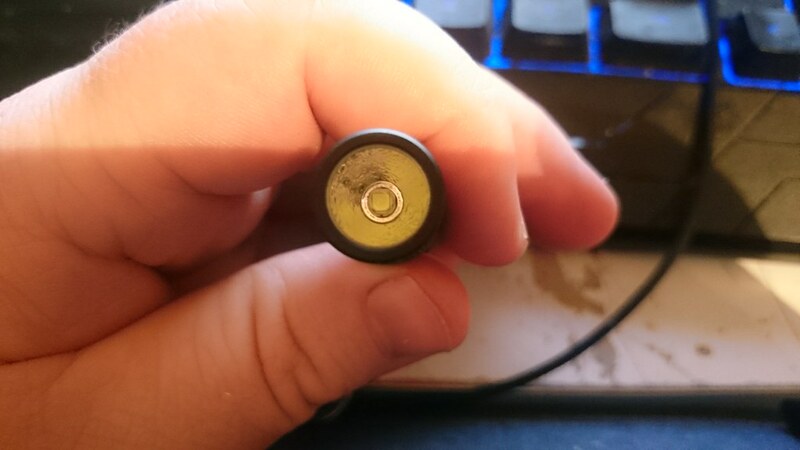 Anyone want to try putting in a battery the wrong way and let us know? Obviously a real issue. I had that with one of my light. Easy fix was to take out the spring and stretch it. I didn’t even read mine. I don’t think it’s needed. Okay, but easily wiped off, no? That won’t affect the beam. Off-center emitter – little to no attention to the assembly process. Missing papers – little to no attention during packaging. Lube all over the light – little to no attention to how much lube is being squeezed. Okay, so now let’s mop up the mess they created, because one cannot expect reasonable quality under $10 (something that I only heard in this thread). Looks like your worldview is way different from mine. And why drag CPF into this thread? How is it even related? My remarks were not personal, I merely stated observations and expectations. I am firm on my opinion: Astrolux A01 from Banggoods is very poor in quality. You don’t have to agree with it. There was nothing personal about the CPF comment, just that on that forum, they tend to act like you did here, and you have a presence there as well, thought you mixed up forums. These lights are by no means perfect, but dollar for dollar, a hell of a deal, so I do disagree with you, and will leave it at that. Actually, they have been dumped into trash. Not worth returning. I picked up an Orange one a few weeks back from BG and no probs with it. which means the quality will also improve. The more you pay the more it’s worth. Budget lights often take some tweaking brand new out of the box to work properly. If you aren’t ready for that, you aren’t ready for budget lights. Or maybe you are because with budget lights you can still throw away half of them and come out ahead. It’s just a shame not to take a few basic steps at fixing a light before you throw it away or try to return it. Fixing lights yourself is one of the main reasons BLF exists. Tightening a retaining ring, sanding the end of a tube, these are just basic. It feels great to bring a light to life like that. Anyway, I’ve bought 4 A01’s and they’ve all worked fine. Members like choombak (a drug reference name, I am guessing?) and their disproportionate complaining here for what they have gotten for bottom dollar drive manufacturers away. They also drive members away from good lights and if they get one that needs an adjustment, perhaps their first foray into modding. Say it ain’t so! I would love a SS and an AA version. I really hope Manker and BG can look past the Cometa fiasco and give the partnership another chance. Say it ain't so! I would love a SS and an AA version. I really hope Manker and BG can look past the Cometa fiasco and give the partnership another chance. Doubtful. Razor Thin margins and three times the work. It is a shame because they would really listen to our ideas. I’m new to this forum (and forums in general). Is there this much drama here? I’ve been here a little while and, aside from the occasional blip, I’ve found that things here couldn’t be more friendly. Are we aloud to swear in the forum? fudge me silly i failed by saying this! This is the Astrolux! I think the Astrolux wins! A light you buy for $10, likely was manufactured for less than $5. There’s not much room for extensive quality control on budget lights. Besides, most of the things you’re complaining about are irrelevant on a small floody light like this. The only thing I really expect on a $10 light is that it works, or that it can be easily fixed to make it work (like I had to do by stretching the spring on one of mine). IMO, the A01 was an excellent light for $9. The emitter is really what makes this light stand out. The quality isn’t perfect, but I have $100 lights for that. The A01 is a nice, simple light, that gives really nice tint, a good selection of output, and is inexpensive enough that it won’t freak me out if I lose it or break it.